RawSpiceBar delivers a monthly spice subscription box featuring 3-4 freshly ground spice blends from a new geography or region every month. 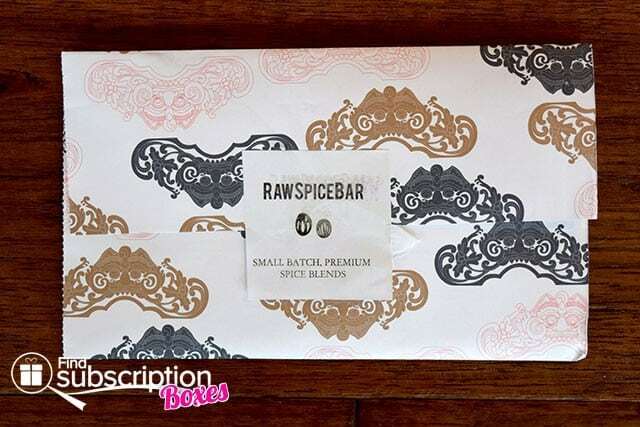 With today’s RawSpiceBar review, we’re taking a closer look at the RawSpiceBar June 2015 Spice Box. June’s RawSpiceBar box brought us the tropical and zesty flavors of Jamaica! 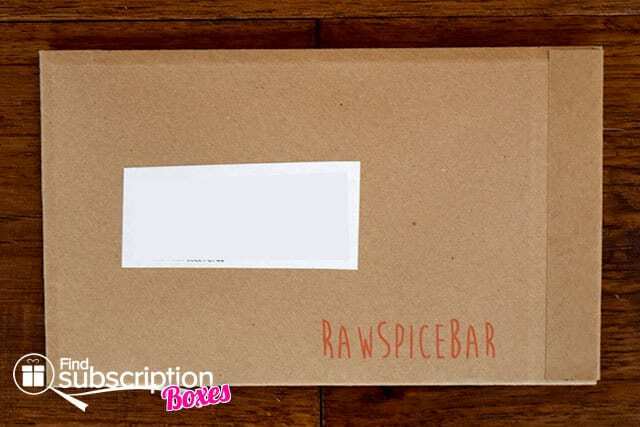 Each RawSpiceBar monthly subscription spice box includes information about that month’s spice blends, as well as 3 kitchen-tested recipe cards you can prepare using that month’s spices. 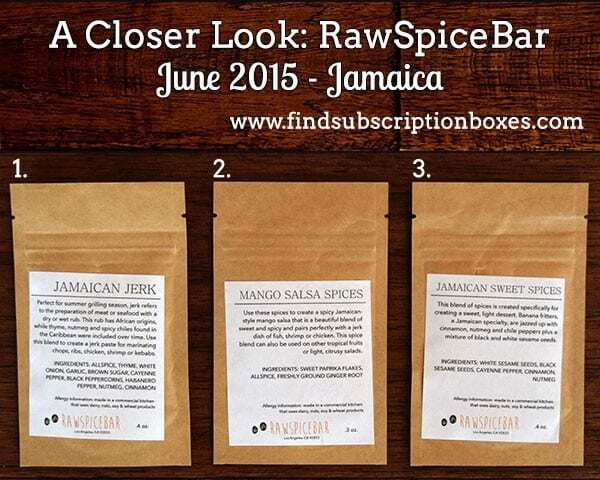 There were 3 spice blends inside our June Jamaica-inspired RawSpiceBar box. Made with thyme nutmeg, and spicy chiles, this blend can be used to create a delicious jerk marinade for pork, chicken, and seafood. We used this spice blend as a rub for jerk chicken, but you can also use them to create RawSpiceBar’s Jamaican Jerk Fish. With sweet paprika flakes, ginger, and allspice, this blends is perfect for a refreshing, citrusy mango and summer corn salsa! Re-create banana fritters, a Jamaican specialty, in your own home with this sweet spice blend made with cinnamon, nutmeg and chile peppers plus a mixture of toasted black and white sesame seeds for a hint of nuttiness. 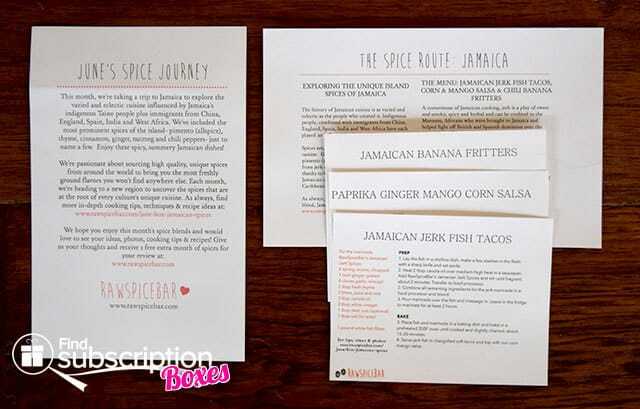 The RawSpiceBar June 2015 spice box made it easy to cook and enjoy the flavors of Jamaica in our own kitchen. We loved that the spice blends could be used in a variety of recipes and foods in addition to the easy-to-follow recipes included in this month’s box. Here’s a shot of our grilled jerk chicken, made with the RawSpiceBar Jamaican Jerk spices! What did you cook up with the June RawSpiceBar Jamaica spice box? How would you rate RawSpiceBar ?